Ssangyong Materials 2015 World Class 300 projects and global companies specialized in candidate selection is final, the documents were selected from July 1 Small Business Administration and the Ministry of Industry career. 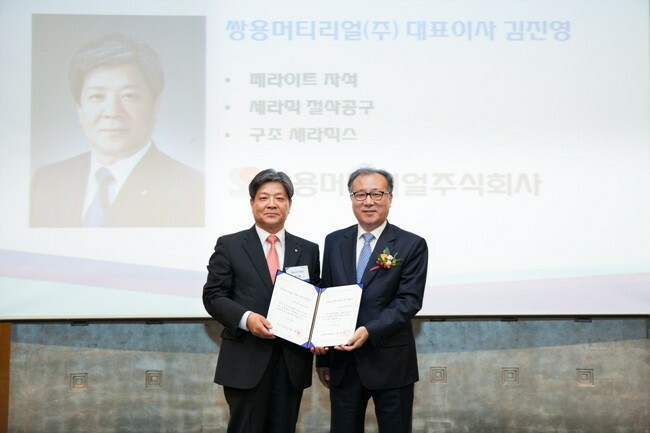 Last year, by world-class 300 Companies Small Business Administration is a global professional candidate companies come to the Industry Career Resources each selection, and merged into co-starter according to October last year, the government of the Korean hidden Championship foster measures, in 2015 30 joint enterprises It was selected. If selected as a Supported Enterprise, the next 10 years the global level, South Korea industry to be the be hidden Championship Technology Promotion Agency, KOTRA and R & D from the 24 supporting organizations, professionals, funds, international marketing, consulting, etc. are subject to a variety of supports. Ssangyong has been recognized the growth potential materials and technology through the World Class 300 and global companies specialized in candidate selection, the vision was to provide a more multi-step hypothesis that can springboard to the "global leader in fine ceramic material part".